POSTALLOY® 216HD (Chapisco), for Roll-Arcing, is primarily engineered for the sugar cane industry and is to be used while the sugar cane roll is rotating. 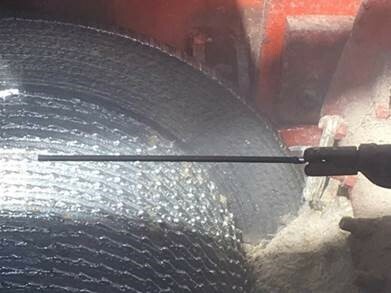 Postalloy® 216HD produces a rough weld deposit that will aid in pulling, tearing and crushing the sugar cane as it feeds through the rolls during processing. Also used for sugar mill rolls hooks (Picote). Postalloy® 216HD is a chromium carbide tubular hardfacing electrode with much higher percentages of carbide forming elements contained in the core than with conventional flux-coated electrodes. It's tubular construction allows it to be used at higher deposition rates and much lower current settings than traditional flux-coated electrodes. 1/4" (6.0mm) is used around 100 amps. Weld chemistry produces a chromium carbide weld deposit for overlaying surfaces exposed to high abrasion and medium impact. Relief checks readily to prevent stress build-up. © 2015-2019 Postle Industries. All rights reserved.